The 2019 Chevy Bolt is designed to revolutionize how drivers, and the automobile industry in general, view the concept of electric vehicles. The latest Chevy Bolt is in its third model year of this first-generation vehicle. The Chevrolet Bolt as a five-passenger, subcompact hatchback, characterized as a CUV, or crossover utility vehicle. This CUV is the most efficient all-electric vehicle to roll off the assembly line. Owners have the option of charging their vehicle at home or on the road at certified charging stations. For owners who opt for a home charging station, certified technicians will come out and set it up. The Bolt comes standard with an electric drive unit, a 60-kWh lithium battery and an electronic transmission selector for Regen on Demand. The Bolt highlights the Regan effect, or status effect, and One-Pedal Driving. In fact, One-Pedal Driving increases the Regen effect. As the name implies, One-Pedal driving means only using one pedal, which, in this case, is the accelerator. The accelerator is used to increase speed, and when drivers need to slow down, they simply ease up off the accelerator. The energy saved when One Pedal driving is implemented is actually returned to the car’s battery, thus increasing the Regen effect allow extended battery life. There are several key changes and updates for the 2019 model year. The new Chevy Bolt introduces smartphone technology that allows drivers to control vehicle entry, start, and operation from the comfort of their smartphone keypad. Seating has been updated to provide an even more comfortable driving experience. Chevy has also prioritized safety. In previous model years, the Driver Confidence Package II was only offered as an available option on higher-end trim models. For the 2019 Chevy Bolt, this package is an available option on the LT trim level as well. Speaking of safety, in addition to the Tire Pressure Monitoring System, the new Bolt now provides visual and audible exterior notifications referred to collectively as Tire Fill Alert. This alert system lets drivers know when a tire has reached its recommended air-pressure level during the inflating process. The 2019 Chevy Bolt comes standard with critical safety features. The Bolt’s interior design features ten airbags that are placed around passengers in the frontal, knee, side-impact and head-curtain zones. The airbags are strategically placed to protect front-seat passengers and outboard-positioned backseat passengers. StabiliTrak is electronic stability and traction control system. This system is designed to automatically assist drivers in safely maneuvering and retaining control in emergencies, as well as slippery driving conditions, by adjusting the brakes and engine power. For drivers with small children and teenagers, the Bolt comes standard with the LATCH system and Teen Driver, respectively. The LATCH system makes it easy for parents to install and secure child-restraint seats properly. Teen Driver helps parents in helping their new teenage drivers not only learn driving skills but also remain safe while doing so. Teen Driver allows parents to customize vehicle settings, including activating key safety features, while limiting other features. The system also generates an in-car report card that details driving behavior, allowing parents and teens to work together to create a safe driving plan. The Rear Vision Camera assists drivers when backing up via a display on the vehicle’s Infotainment screen. The camera allows drivers to view the rear area of their vehicle, alerting them regarding any persons or objects that may be in the path, or approaching the proximity, of their vehicle to hopefully avoid a collision. The new Bolt comes standard with OnStar and Chevrolet Connected Services capability, giving drivers the peace of mind of having access to trained professionals in the case of an emergency. The 2019 Chevy Bolt also offers many available safety options, including Low-Speed Forward Automatic Braking, Lane Keep Assist with Lane Departure Warning, Forward Collision Alert and IntelliBeam. The 2019 Chevy Bolt comes standards with an impressive list of technological features. The Bolt’s keyless open and start allows drivers to lock and unlock their vehicle, as well as start and stop their vehicle, without a key fob or a key, respectively, providing enhanced security for the driver and vehicle. At a glimpse, the Driver Infotainment System provides a visual summary of the vehicle’s electrical performance. Courtesy of an eight-inch-diagonal, multicolor, configurable display, drivers can view the battery status, propulsion power, and efficiency. The Visual Efficiency Display comprises energy information screens that not only provide the driver with the vehicle’s energy efficiency but also give the driver the ability to program charging times. The Driver Infotainment System and Visual Efficiency Display give drivers confidence in keeping track of their vehicle’s performance. The Bolt also comes standard with Chevrolet’s Infotainment System, a 10.2-inch diagonal color touchscreen. Drivers are afforded Bluetooth streaming audio, as well as Apple CarPlay and Android Auto capability for compatible smartphones. Drivers also receive a SiriusXM trial membership. Chevrolet did not forget about sound quality. The 2019 Bolt is equipped with a six-speaker audio system. Enjoy your favorite music or podcast on every drive. Chevrolet Connected Access, including 10-year access to standard connectivity; this access enables the vehicle’s diagnostic systems<? </uil>. When drivers need to take care of those maintenance recommendations, or any unexpected vehicle needs, they can head over to their local Chevrolet dealership. They can have confidence that their vehicle will receive quality service, courtesy of EV-certified Chevrolet staff. Staff is also available to walk them through the process of understanding and using their Complete Care package benefits. 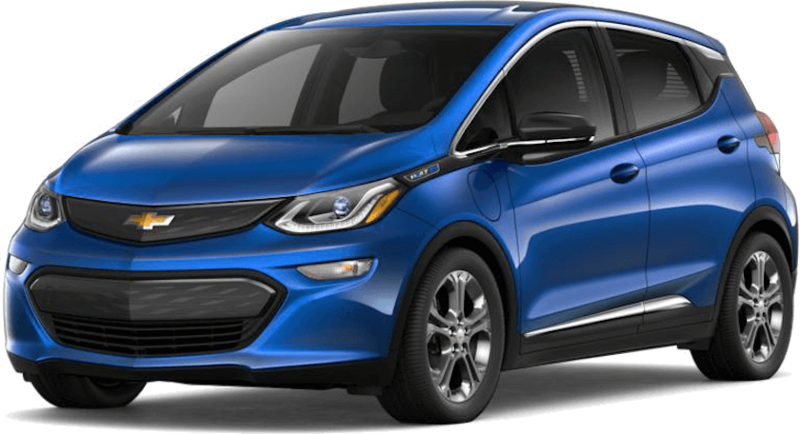 The 2019 Chevy Bolt is the most efficient all-electric vehicle on the market. On a full charge, collectively city and highway, this vehicle gets an EPA-estimated electric driving range of 238 miles. On average, the Bolt gets an EPA-estimated electric driving range of 255 miles in the city and 217 miles on the highway. Depending on the charger being used and the current, the Bolt’s charging times vary. The 120-volt charger and standard-cord combination offer the slowest charge and shortest driving range. The Bolt charges roughly four miles of range per hour. When using the 240-volt charger, charging time is reduced, while the driving range increases. The vehicle charges 50 miles of range in under two hours. The Bolt is completely charged in about 9.3 hours using the 240-volt charger. As the name implies, the fastest charging time and longest driving range are achieved using the SEO Combo DC Fast charger. The Bolt gets a 90-mile charge in just 30 minutes. As outlined, depending on the available charging time and driving distance, the Chevy Bolt offers a variety of options to achieve your goal. As an all-electric vehicle, the 2019 Chevy Bolt will surprise most people. The Bolt’s top speed is 91 mph. It accelerates from zero to 30 mph in 2.9 seconds. It accelerates from zero to 60 mph in under seven seconds. The Bolt will make drivers rethink their vehicle of choice when talking about acceleration off the line. The MSRP for the 2019 Chevrolet Bolt LT, which is the base model, is $37,495. Depending on federal guidelines and tax laws, individuals purchasing the new Bolt are eligible for a federal tax credit of up to $7,500. Depending on the state in which they live, they may be eligible for an additional state tax credit. To get more information, please consult your tax professional. Visit us at McCluskey Chevy! Located in Cincinnati, OH, McCluskey Chevrolet is the go-to dealership in the Tri-State area, whether you’re shopping for your next vehicle, needing to come in for routine maintenance or needing to take care of a major repair. The dealership is customer-service oriented. McCluskey understands customers’ schedules vary and changes can occur. To meet those varying needs, the dealership and service department is open seven days a week. Monday through Thursday, the sales department and service department staff work extended hours. The sales staff are available until 9 p.m., and the service department staff are available until 3 a.m. Talk about dedication. McCluskey Chevrolet has a long history of not just talking about what they can do for customers. They produce results. If you’re in the market to trade in your current vehicle, McCluskey offers top dollar for your trade-in. If you’re looking for a specific vehicle, the dealership has access to a nationwide 100,000-vehicle inventory. If that vehicle is not at the dealership, McCluskey’s sales team will work to find it and bring it to the dealership. If you feel financing is a concern, McCluskey won’t let it be. The dealership offers a variety of financing and leasing options to fit most budgets. And above all, McCluskey Chevrolet is committed to the “McCluskey difference,” making sure the car-buying experience is joyous and one to remember.